It has been a popular expat destination for years, and with a thriving business sector and a modern living environment. Furthermore, the lack of income tax also continues to peak a lot of interests. 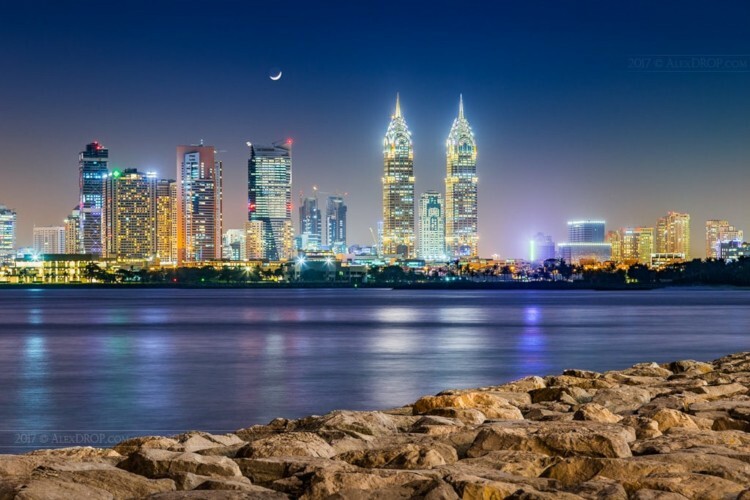 Moving to the UAE will give you a choice of seven emirates (similar to principalities): Abu Dhabi, Ajman, Dubai, Fujairah, Ras al-Khaimah, Sharjah, and Umm al-Quwain. The majority of expats moving to the UAE will find themselves in the capital of Abu Dhabi, or in Dubai. The thriving community of expats means plenty of Westernized areas and cosmopolitan cities. The UAE have a thriving nightlife that competes with infamous cities like London and New York City. The roots of the country should never be forgotten, however. Desert temperatures can average up to 40°C over the summer. Furthermore, a range of interesting foods and goods can be found in markets and shops during those times. Arabic is the official language and Muslim the official religion. It’s important to remember that this country is a mix of its own traditions as well aspects more familiar to many Western expats. The UAE is home to the world’s tallest building. Burj Khalifa stands over 828 meters tall and has over 160 stories. If you don’t hold a UAE passport, you’ll need a visa to work in the emirates – which generally means you’ll need a job already and an employer willing to help you with the process. Work permits are managed by the Ministry of Human Resources and Emiratisation (MoHRE) and applications are made through employers, not by individuals. There is a a 60 day Work Visa available which will allow you to arrive in the UAE and begin working straight away. During this time you’ll need to apply for employment and residency visas, with a prerequisite health check. On the other hand, the residency visas are normally issued for two to three years. Once you have permission to work you’ll also be issued with a labour card. You can find out more about the application process and different visas on the Government website. Some countries will be able to visit the UAE for 30 to 90 days just on their passport, but for others a temporary visa will be needed. There are a range of other more permanent options available, including multiple-entry visas and resident’s family visas. If you are moving to the UAE for work, once you’ve secured a residency visa (as part of the working visa process) you’ll be able to apply for a visa for your family. The Federal Customs Authority (FCA) manages customs and importation. 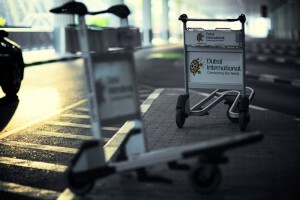 They have a set of Common Customs Laws that are executed and managed independently for each of the Emirates. For UAE customs prohibited and restricted items include the usual suspects (like weapons and narcotic drugs). There are some other items to consider that have a more cultural focus – including goods from Israel, images which contradict Islamic teachings, and homemade food. You’ll need to declare films, books, and photographs, medicines, and valuables or money up to AED 100,00, as well as some other items. 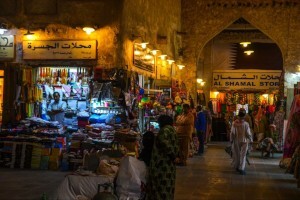 This list of Dubai customs prohibited items and restricted goods is a helpful guide, although you may want to check the FCA website for your specific emirate. 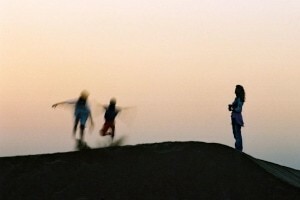 Weekends in the UAE fall on Friday and Saturday. The UAE has a growing economy with fantastic expat opportunities in a range of sectors. According to the website Arabian Business, the 5 key areas are advertising and media, engineering and construction, oil and gas, retail, and manufacturing. A recent article about the top paying jobs in the UAE highlighted some surprises. For example, there’s a (perhaps ironically) high demand for tax managers. The Emirates are also making strong use of digital technology as a way for managing business, creating ever more opportunities for internationals with the right skills and experience. Roles like data managers and chief digital officers are in demand and have a decent salary to boot. Although household salaries in the UAE have been averaged at AED18,248.60, the average expat salary was reported as $138,177, with many expats saying they had much more disposable income than they did when at home. This salary makes moving to Dubai for work a popular choice – Dubai has the second highest expat employment levels in the world, with 92% in employment. And the top salaried careers? Chief Marketing Officers and finance professionals can earn up to an average AED90,000, civil engineers earn an average AED101,800 per year, and lawyers can get up to AED106,000. A program known as Emiratisation has put governmental pressure on companies to employ locally to help reduce national unemployment rates. This has meant a reduction in opportunities for overseas workers, and as such it’s wise to secure a job before deciding to relocate. 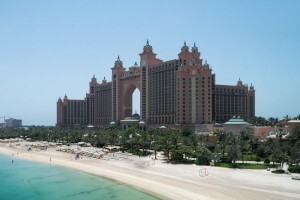 Moving to Abu Dhabi and Dubai without a job can be difficult in the first place as so many visas depend on employment. The top job boards include Bayt, Monster Gulf, Gulf Talent, and Indeed. Official government job portals can be found on the government website. Arabic is the official language. English is widely spoken though, in local populations as well as expat communities. You may even have the chance to learn the local lingo while you’re there. There are no taxes in the UAE, one reason it’s such a popular expat destination. While the UAE can be costly to live in, high salaries and a lack of tax tend to compensate. The average household expenditure is AED11,241.20 a month, while the average income is AED18,248.60 – so there’s plenty left over to take advantage of the Emirates’ leisure opportunities. On average, about 40% of income will be spent on housing and utilities, while just under 15% goes into food and drink. You can visit Expatisan to give yourself an estimate of the cost of living. 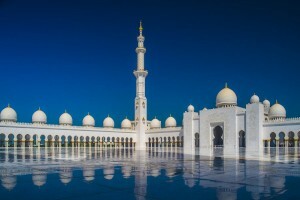 The United Arab Emirates dirham or Emirati dirham is the local currency, abbreviated to “AED.” The exchange rate is approximately USD $1 to AED3.67, SGD$1 to AED2.7, and GBP £1 to AED 1.87. To check current exchange rates, visit XE.com. The banking sector is regulated onshore by the UAE Central Bank. There are four types of banks across the UAE – commercial, investment, Islamic, and industrial. Banks are predominantly local, and these are all state-owned. The big names include Emirates NBD, National Bank of Abu Dhabi, First Gulf Bank, and Union National Bank. There are also a range of international options that may seem more familiar to expats, including CitiBank N.A., HSBC, Royal Bank of Canada, and UBS. Banks usually offer quite competitive rates for international transfers, but shop around. In some cases the companies that do it for a day job – such as XE and TransferWise – may have better options. Residents of the Emirates don’t have to pay the emirate authorities tax on earnings. However, just because you’re not paying tax in the UAE doesn’t mean that as an expat you won’t be liable to pay tax elsewhere in the world. It’s always good to seek professional advice. And although there’s no income tax, there are taxes if you buy or sell property, and an excise tax has been applied to some products. VAT is also being introduced – and it is possible that income tax could make an appearance in the future. 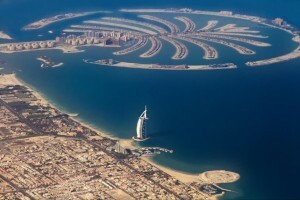 The man-made island of Palm Jumeirah is in the shape of a palm tree. Property is expensive. For this reason, whether buying or renting, most people choose to live in apartments. The good news is most apartments are very modern and well-designed, and complexes tend to include other facilities like gyms and parking (even banquet halls). Abu Dhabi and Dubai have both made it into a Top 20 list of the best cities for expats. Most rental contracts are for at least a year, and your landlord may ask that you pay in advance (either quarterly or yearly). If you want to leave your contract early you probably won’t see a refund. Additionally, the monthly rent for a large furnished apartment will cost between AED7,941 and AED6,971 a month. Buying can be a good option if you’re thinking of staying more than five years. Although a large majority of expats still choose to rent, this is mainly because of the down payment required for a house. The Central Bank requires that expat buyers have a 25% cash deposit to pay for houses up to AED5 million, and 35% for more expensive properties. This, along with other fees and commissions, can become quite expensive. However, with relatively high salaries and house prices dropping, those who can muster together the initial deposit might consider making an investment. Ramadan is a month-long ritual of fasting observed by the Muslim population. This important month in the calendar is evidenced in daily life. One of the downsides of paying no tax is you’ll need to pay for your own medical insurance. Generally, healthcare in the UAE is excellent, with modern medical facilities that are highly accessible. It is important to have good medical insurance. Depending on where in the UAE you live, it may be compulsory for your workplace to provide this. It’s also a prerequisite to obtaining permanent residency. If you’re looking for fast internet, you could do a lot worse than the UAE. Their network supports high-speed connections access to more than 93% of households. When surfing, keep in mind that in the UAE there are some strict rules about morality, including age ratings on content – there’s information on the Telecommunications Regulatory Authority website. The website IndexUAE has a list of internet providers. There are two popular phone companies – Etisalat and Du. It’s very easy to get a local SIM card (you can pick one up at the airport) and both companies offer a deal for new arrivals. It’s a bit more expensive than a longer term plan, but great when you need something quickly. There’ll be pressure from the companies to buy a combo package including landline, internet and TV for a single monthly fee over a contract period (generally two years). Keep in mind that there may be some restrictions on video capabilities like Facetime, depending on where you’ve bought your phone. Most Emirates have their own utility companies. In Abu Dhabi, it’s the Abu Dhabi Distribution Company who are sole providers of electricity, water, and sewerage. When you rent or buy, you’ll need to connect to ADDC, which can be done online or in person. In Dubai, you’ll need to set up an account with the Dubai Electricity and Water Authority. Across the emirates, electricity is 240v 50Hz AC. Although tap water can be questionable in some areas, in the larger cities it is safe to drink. There is no postal system in the UAE – at least, not like you know it. Your office is your post box. Most organisations have a Post Office Box at the local Emirates Post Office and usually someone has the task of collecting this every day or two. More recently a personalised pickup and delivery system to your home address has been established, but it’s relatively new and does come with an extra cost. Want to ski in the desert? The theme park Ski Dubai contains real snow, and even penguins as part of a conservation programme. If you’re bringing across children, make sure you research schools and start the enrolment process as soon as possible. As there’s no free or government-sponsored schooling in the UAE for children coming from overseas, expats usually turn to private international schools. There are plenty of international schools in both Dubai and Abu Dhabi, usually with high standards. On the other hand, the downside is high fees and limited space. The website EdArabia has some useful information about top schools across the Emirates based on curriculum. It also has other useful information about schooling in the UAE. In the UAE pet import is an option. Your cat or dog will need to be microchipped, vaccinated (including rabies vaccinations), and have a certificate of health. You’ll need to apply for an import paper from the Ministry of Climate Change and Environment, with up to two pets per permit. If you’re aware of the pet rules in the UAE, Links moving can help you move to the UAE with a dog or cat through our Pet Relocation Service. The police force in Dubai have a very impressive fleet, including Bugatti, Ferrari and Lamborghini vehicles. Public transport is reasonably good, with links within and across the emirates, and transportation across water. 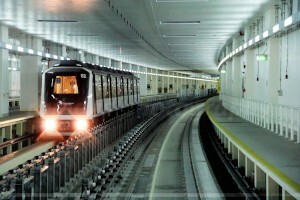 Dubai is the only emirate that has a tram and metro system, which covers around 80 km. Taxis are the most popular option for public transport and are regulated by the government with a fixed fare rate. Moreover, the bus system is good and some emirates have their own card payment system – the Nol card in Dubai, the Hafilat card in Abu Dhabi, and the Sayer card in Sharjah. The road network is efficient across the Emirates, so if you want to take your own transport you may find it quite enjoyable. You’ll need to have a valid international or UAE drivers license, and it’s important to know the road toll rules. The government has introduced a parking system managed by mobile phones (mParking) which makes it easy to pay the parking fare. Generally, buying a car in the UAE is much cheaper than importing one and requires less paperwork and waiting for approvals. There will be fees for insurance and registration, as well as a tax equal to 5% of the vehicle’s valuation. If you’re thinking about car export to Dubai or another emirate from your home country, Links can help with the car importation.